Form 1040EZ is a type of tax form circulated by the Internal Revenue Service (IRS). American taxpayers use the form to estimate their expected withholding in order to know how much refund to expect or the amount they owe the IRS. 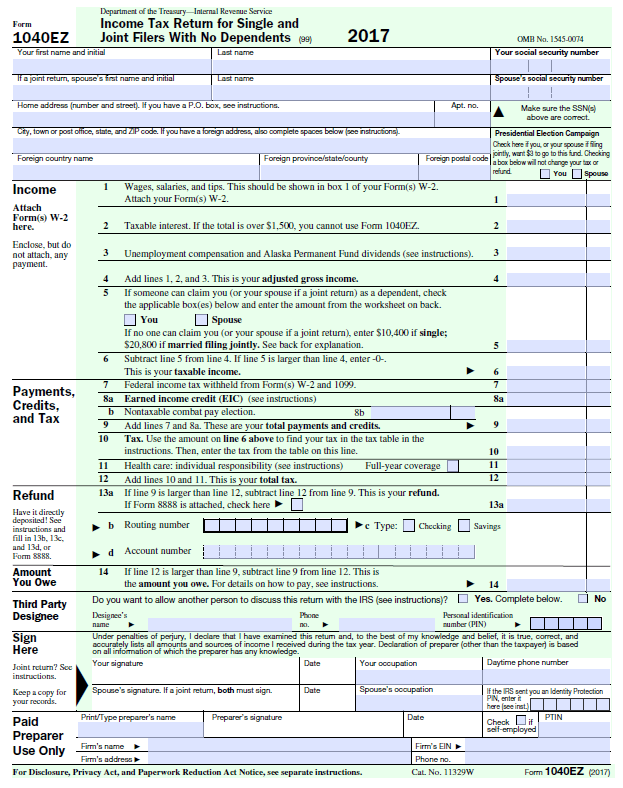 A large segment of the American population is qualified to use Form 1040EZ. Filling out the form takes less time compared to Form 1040 or Form 1040A as the latter two are quite long. In addition, Form 1040EZ is best suited for individuals who don’t have dependents, did not go to college within the year, or don’t own homes. Who Is Eligible to Fill Form 1040EZ? The individual is a citizen of the United States or is a resident alien. The individual’s status is single or is married and is filing jointly. The individual’s total income is less than $1500. The individual’s income is made up of grants, scholarships, wages, unemployment compensation, interest, or permanent fund dividend. The individual is 65 years or below. The individual is currently not reporting tax deductibles as adjustments to his income. Nevertheless, a taxpayer can choose to use Form 1040A as a substitute for Form 1040EZ. While the former is quite long, it allows an individual to document a broader range of deductions and income. After providing all the information on Form 1040EZ, the last thing an individual should do is double-check the information and ensure he spelled his name and Social SecuritySocial SecuritySocial Security is a US federal government program that provides social insurance and benefits to people with inadequate or no income. The first Social Security Act was signed into law in 1935 by President Franklin D. Roosevelt. The law underwent several modifications over the years to include several social welfare number correctly. Why? Well, the IRS takes longer to look through the form and process tax returns where the name and SSN don’t match those they have in their records. Delayed processing often causes a delay in the issuance of tax refunds. Individuals who wish to change their SSN or name should visit the social security administration before filing their tax returns. There should be a Form W-2 for each employer that an individual has worked for that shows wage incomeRemunerationRemuneration is any type of compensation or payment that an individual or employee receives as payment for their services or the work that they do for an organization or company. It includes whatever base salary an employee receives, along with other types of payment that accrue during the course of their work, which, as well as tax withholding. Form W-2 is usually available to be collected towards the end of every January. Each W-2 is needed before tax returns can be filed. The form helps the IRS to calculate and add up withholding and wages so that they can be reported on tax returns. Form 1099-INT is availed by banks or credit unions. It reports the total amount of interest incomeInterest IncomeInterest income is the amount paid to an entity for lending its money or letting another entity use its funds. On a larger scale, interest income is the amount earned by an investor’s money that he places in an investment or project. A very simple and basic way of computing it is by multiplying the principal amount by the interest rate applied an individual received over the year. The form is available for collection towards the end of January as well. If a person does not receive Form 1099-int, it means he did not earn more than $10 in terms of interest at his bank. A bank will only issue the form if a person earned more than $10 in interest. Individuals who are on unemployment benefits should provide Form 1099-G. State agencies use the form to report the total amount of unemployment benefit received by an individual. The unemployment benefit figure is needed when a person is filling up form 1040EZ. Also, Form 1099-G is used by state agencies to report tax refunds received by an individual. Individuals who filled up Form 1040A or 1040-EZ in the previous year don’t need to provide Form 1099-G. A tax refund becomes taxable only when a person itemizes his deductions in the previous year. Gross income is calculated on the fourth line on Form 1040EZ. Adjusted gross income (AGI) is used by banks to measure a person’s income for the year. AGI also measures the amount of premium assistance tax credit a person is eligible to receive. Thus, the IRS uses AGI to verify a person’s identity while filing tax returns. Form 1040EZ combines deductions and exemptions together to form a single value. For individuals who are above the legal age, the two items total up to $10,300 if single or $20,600 if it’s a married couple filing returns jointly. Dependents, on the other hand, receive much lower deductions and so, they are not eligible for personal exemptions. At the back of the form, a worksheet is provided to calculate the total exemption amount for dependents. When standard deductions and personal exemption are combined, they represent total deductions, but the total is not subject to income tax. Taxable income is worked out on line 6 of 1040EZ. With the figure, the IRS is able to locate a person’s federal income tax on tables at the back of the form’s instruction manual. The total taxable income is usually less than gross income since personal exemption and standard deductions are subtracted from taxable income. As an American citizen, whether employed or not, a person is required to make yearly submissions to the IRS. Part of the process involves filling up Form 1040EZ and a few others. The form allows the IRS to calculate the total amount of tax a person should pay to the government. For some people, filling up Form 1040EZ is quite challenging, especially because there are other forms that should be filled as well. Fortunately, we’ve listed above a few things that should be done when filling up form 1040EZ to make the process easy. Accounting for Income TaxesAccounting For Income TaxesIncome taxes and its accounting is a key area of corporate finance. Having a conceptual understanding of accounting for income taxes will allow a company to to maintain financial flexibility. Tax is an intricate field to navigate and often confuses even the most skilled analysts.